Not to be confused with observer.com. Upon Frederick's death in 1903, the paper was purchased by the newspaper magnate Lord Northcliffe. After maintaining the existing editorial leadership for a couple of years, in 1908 Northcliffe named James Louis Garvin as editor. Garvin quickly turned the paper into an organ of political influence, boosting circulation from 5,000 to 40,000 within a year of his arrival as a result. Yet the revival in the paper's fortunes masked growing political disagreements between Garvin and Northcliffe. These disagreements ultimately led Northcliffe to sell the paper to William Waldorf Astor in 1911, who transferred ownership to his son Waldorf Astor, 2nd Viscount Astor four years later. During this period, the Astors were content to leave the control of the paper in Garvin's hands. Under his editorship circulation reached 200,000 during the interwar years, a figure which Garvin fought to maintain even during the depths of the Great Depression. Politically the paper pursued an independent Conservative stance, which eventually brought Garvin into conflict with Waldorf's more liberal son David Astor. Their conflict contributed to Garvin's departure as editor in 1942, after which the paper took the unusual step of declaring itself non-partisan. Ownership passed to Waldorf's sons in 1948, with David taking over as editor. He remained in the position for 27 years, during which time he turned it into a trust-owned newspaper employing, among others, George Orwell, Paul Jennings and C. A. Lejeune. Under Astor's editorship The Observer became the first national newspaper to oppose the government's 1956 invasion of Suez, a move which cost it many readers. In 1977, the Astors sold the ailing newspaper to US oil giant Atlantic Richfield (now called ARCO) who sold it to Lonrho plc in 1981. It became part of the Guardian Media Group in June 1993, after a rival bid to acquire it by The Independent was rejected. Farzad Bazoft, a journalist for The Observer, was executed in Iraq in 1990 on charges of spying. In 2003, The Observer interviewed the Iraqi colonel who had arrested and interrogated Bazoft and who was convinced that Bazoft was not a spy. In 2003 the editorial supported the Iraq war stating "Military intervention in the Middle East holds many dangers. But if we want a lasting peace it may be the only option." The Observer followed its daily partner The Guardian and converted to Berliner format on Sunday 8 January 2006. The Observer was awarded the National Newspaper of the Year at the British Press Awards 2007. Editor Roger Alton stepped down at the end of 2007, and was replaced by his deputy, John Mulholland. The Observer and its sister newspaper The Guardian operate a visitor centre in London called The Newsroom. It contains their archives, including bound copies of old editions, a photographic library and other items such as diaries, letters and notebooks. This material may be consulted by members of the public. The Newsroom also mounts temporary exhibitions and runs an educational programme for schools. The paper was banned in Egypt in February 2008 after reprinting cartoons allegedly insulting Mohammed. The Observer was named the British Press Awards National Newspaper of the Year for 2006. Its supplements have three times won "Regular Supplement of the Year" (Sport Monthly, 2001; Food Monthly, 2006, 2012). In May 2017 The Observer helped sponsor The Convention on Brexit. Richard Cockett, David Astor and The Observer, André Deutsch, London, 1990, 294 pp. with index. ISBN 0-233-98735-5. Has endpapers that are facsimiles of The Observer, with other black-and-white photographic plates of personnel linked to the newspaper. ^ Graham Snowdon, "Inside the 19 January edition", The Guardian Weekly, 16 January 2018 (page visited on 19 January 2018). ^ Matt Wells (15 October 2004). "World writes to undecided voters". The Guardian. UK. Retrieved 13 July 2008. ^ "The Observer has reported in accordance with ABC's industry-agreed standards for National Newspapers". www.abc.org.uk. Retrieved 30 April 2018. ^ Dennis Griffiths (ed. ), The Encyclopedia of the British Press, 1422–1992, London and Basingstoke: Macmillan, 1992, p. 159. ^ "Key moments in the Observer's history - a timeline". the Guardian. 7 November 2017. ^ Michael Leapman, "New editor chosen for 'Observer': 'Guardian' deputy to succeed Trelford", The Independent, 14 May 1993, accessed 22 January 2018. ^ Ed Vulliamy, "Writer hanged by Iraq 'no spy'", The Guardian, 18 May 2003, accessed 4 April 2007. ^ "Iraq war: the march of time", The Guardian, 15 February 2013. ^ Observer blog, accessed 27 February 2007. 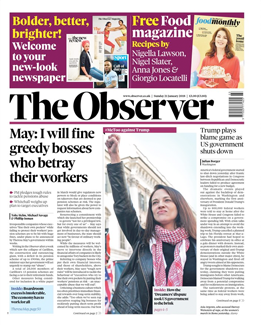 ^ Claire Cozens, "Observer announces relaunch date", The Observer, 19 December 2005; accessed 27 February 2007. ^ The archive – summary of holdings, accessed 27 February 2007. ^ Ltd, Magstar. "Press Awards". www.pressawards.org.uk. Archived from the original on 2 April 2016. ^ Stephen Brook (3 January 2008). "Mulholland reshapes Observer team". The Guardian. UK. Retrieved 17 February 2008. ^ John Mulholland, "Welcome to the new Observer", Guardian.co.uk, 21 February 2010. ^ Gavriel Hollander (27 August 2003). "Observer to launch new monthly technology supplement". Press Gazette. Retrieved 21 May 2015. ^ "Observer wins top prize at 2014 Newspaper Awards". The Guardian. 2 April 2014. Retrieved 21 May 2015. ^ "New editor at the FINANCIAL TIMES" (PDF). Press Business (1). February 2006. Archived from the original (PDF) on 14 October 2013. Retrieved 7 October 2013. ^ "How to access past articles from the Guardian and Observer archive". the Guardian. 15 November 2017. ^ "Paul Webster appointed new editor of The Observer". the Guardian. 18 January 2018.